German hysicists at the Johannes Gutenberg University Mainz have developed a quantum interface which connects light particles and atoms. The interface is based on an ultra-thin glass fiber and is suitable for the transmission of quantum information. This is an essential prerequisite for quantum communication which shall be used for secure data transmission via quantum cryptography. "Our quantum interface might also prove useful for the realization of a quantum computer," adds Professor Dr Arno Rauschenbeutel from the Institute of Physics at Mainz University. Today, telephone and internet primarily rely on the optical transmission of data using glass fiber cables. In that sense, glass fiber networks can be considered as the backbone of the modern communication society. The light that travels through them is not a continuous flow of energy. It rather consists, as was discovered by Albert Einstein, of indivisible energy quanta, or photons. Each photon can then transmit one bit of information, corresponding to a zero or one. In addition to being very efficient, this also opens the route towards entirely new ways of communication because, being quantum objects, photons can exist simultaneously in both states, zero and one. As an example, this property is what makes quantum cryptography possible and thereby enables absolute protection against eavesdropping. In order to fully exploit the potential of quantum communication, however, one additionally needs the possibility to store the quantum information that is encoded on each photon. Photons themselves are not well suited for this purpose because one cannot hold them at a given position. Therefore, it would be much more advantageous to transfer the quantum information to atoms. For this purpose one thus requires a quantum interface between photons and atoms which should ideally be easily integrated into glass fiber networks. A group of physicists led by Professor Arno Rauschenbeutel has now realized such a glass fiber-based quantum interface. As reported by the research team in the current issue of the scientific journal Physical Review Letters, the central part of the work in Mainz is a glass fiber which has been heated and stretched until it measures only one hundredth of the diameter of a human hair. Remarkably, this nanofiber is thinner than the wavelength of the light it guides. 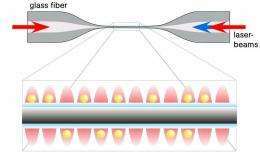 As a consequence, the light is no longer restricted to the inside of the nanofiber but laterally protrudes into the space surrounding the fiber. Using this so-called evanescent field, the scientists trapped cesium atoms after they have been cooled to a few millionth of a degree above absolute zero by irradiation with suitably chosen laser light. When trapped, the atoms are arranged in a regular pattern and are levitated 200 nm above the surface of the nanofiber. This distance might seem very small but it indeed is big enough to protect the atoms from the spurious influences of the fiber surface. At the same time, the atoms reside in the evanescent field and thus interact with the photons propagating through the nanofiber. As was demonstrated by the researchers, this process is so efficient that only a couple of thousand atoms should suffice for a close to lossless transfer of quantum information between photons and atoms. Further possible applications of the Mainz quantum interface include the connection of different quantum systems. As an example, the trapped atoms could be brought into close vicinity of a superconducting quantum circuit in order to combine the advantageous properties of both systems. This would then be an important step towards the realization of a quantum computer. The "discovery" of the photon, based on the interpretation of experimental results that otherwise seemed mysterious, was made in a scientific paper by Albert Einstein in 1905. It may work, but the theory behind it doesn't seem to make sense to me. The picture above makes perfect sense, but only in a 1 or 2 dimensional world. In other words, EM/light waves are 3D spatially, they are not the real sin wave curves we see in class, that's just a representation for our feable brains. In a fiber optic channel, I would imagine that the photons just wiggling back and forth along the channel; in a light bulb, I'd imagine the photons wiggling back and worth away and to the lightblub in all directions. With that in mind, I don't understand how this could work. I mean, the picture makes perfect sense for a sin wave, but 2D sign waves only exist on paper. I need a visual aid or something.Please help, engineer not physicist. "a few millionths of a degree above absolute zero..."
I meant black body radiation. As far as I know, Einstein did not develop any theories regarding the emergency data storage devices (black boxes) for commercial aircraft. There should have been some sort of recognition of Planck, in my opinion he did a lot more than Einstein.